5 October 2018, SPOOKTACULAR FUN FOR KIDS & FAMILIES! 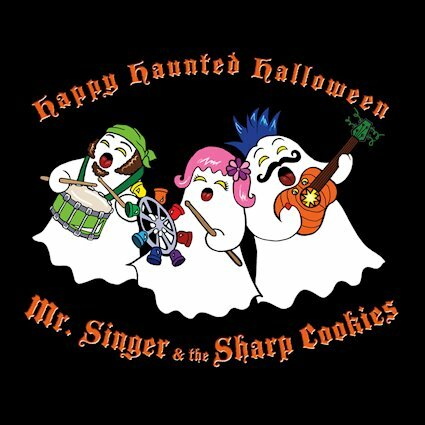 Chicago’s most energetic band that rocks for kids, the award-winning Mr. Singer & the Sharp Cookies, goes all out for the season of ghosts and goblins with their fourth album, Happy Haunted Halloween, set for release on October 5, 2018. Both onstage and in the studio, Mr. Singer and the Sharp Cookies specialize in fresh, positive, high-energy music at kid-friendly volumes, sneaking a little mischief, a little sweetness, and a lot of fun into their clever originals.Notes Neil Firstenleit, “Halloween is my favorite holiday, and inspiration always strikes around that time. Each year for the past fifteen years or so, I’ve written Halloween songs for kids. Happy Haunted Halloween comprises the fourteen best songs of the collection; it’s a fun album you could play on your porch as kids come trick-or-treating, at Halloween parties, or in the car anytime you want to get psyched for Halloween. It was a blast recording this album, especially experimenting with eerie sounds and song arrangements! “Happy Haunted Halloween kicks off with “Happy Halloween,” a truly happy, upbeat dance number about the excitement kids feel before going trick-or-treating on Halloween night. “Ain’t Scared of Nuthin'” is a little bit of Halloween bravado and some “I’m not so sure about this!” set to a Bill Haley-type boogie-woogie, featuring guest artist Mr. Nick Davio. “Grandpa’s Ghost,” about a grandpa whose life is saved by the harmonica in his pocket, is straight-up country, while “Dream of the Bonfire,” a melodious ode to bonfire celebrations, overflows with all the good things about spending Halloween with friends. If Simon and Garfunkel wrote a song with Danny Elfman, the result might be “She Writes Frankenstein,” the ballad of author Mary Shelley told to stormy sound effects and spooky music, encored by “Insane Scientist Victory Blitz,” a super-wild dance song inspired by Frankenstein that will put a smile on monsters large and small. Then there’s the psych-punk “Something Sweet for Halloween,” whose opening lines say it all: “These are scary times we’re living in, and it appears the bad guys have begun to win/So I’m not gonna be adding to the fear, I’m gonna be something sweet for Halloween this year.” Happy Haunted Halloween dances to a splendid finish with “Haunted Halloween,” which just might possibly inspire a little howling at the moon. 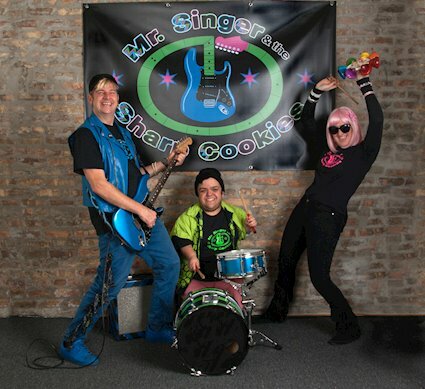 Previous albums by Mr. Singer & the Sharp Cookies include Going to a Party! (2017), Bouncing Ball of Energy! (2012), and Muddy Water Beaver Dam (2005).